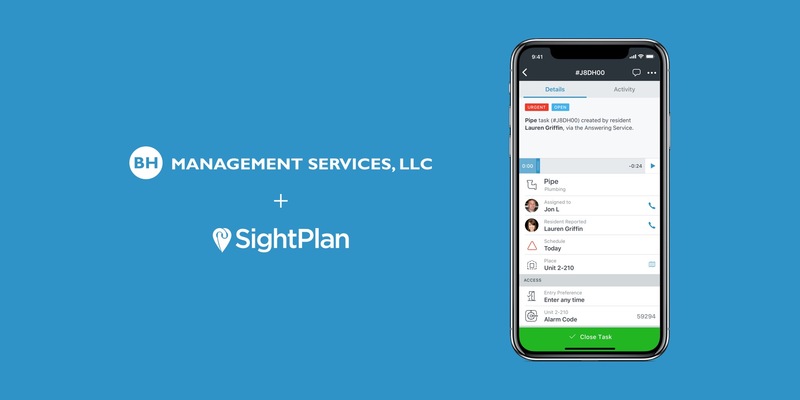 BH Management, manager of over 80,000 apartment units throughout the country, announces a partnership with SightPlan, the award-winning provider of service management software, to deliver a holistic operations platform for service requests, inspections, unit turns, preventive maintenance, compliance, and resident engagement to the BH Management portfolio. BH began working with SightPlan the middle of last year on a plan to provide on-site teams with modern mobile tools to streamline operations, enhance performance, and improve communications to meet their ever-increasing resident service expectations. Having met with success in fully implementing an enhanced integrated communications platform, BH is now continuing its nationwide expansion of the partnership by deploying and utilizing SightPlan’s holistic tools to streamline inspections, preventive maintenance, and daily service requests. “It has always been our mission to create value. The emerging proliferation of smart phones has created new opportunities to do just that and BH is seizing that opportunity with emerging, yet proven, technology. SightPlan has greatly improved and personalized the communication between our residents and on-site teams through integration with our Yardi platform and with the flexibility in SightPlan’s solution to utilize preferred channels of communication, where residents choose among voice, text, email, and/or push-notification depending on how they wish to interact with us. An effective solution is not just about product though, the SightPlan training and customer success teams have also worked with us every step of the way in our successful implementation” said Tasha Krawiec, Vice President of Property operations. “The forward looking BH team has been fantastic to work with. We’re both focused on delivering real-world, everyday solutions to enable both their on-site teams and corporate leadership to deliver great results for residents, and subsequently clients. The partnership has been rewarding because both of us push each other to expand the envelope,” said Terry Danner, SightPlan CEO. “The emerging mobile environment and the multifamily-specific tools to work within it are helping to close what have long been operational gaps that previously had no realistic solution.” BH Management moved into the top 10 largest management companies as ranked by the National Multifamily Housing Council. Their success is directly attributed to their passionate commitment to enhanced service to their residents, their employees, and their clients. To learn more about today’s announcement, how SightPlan can help your community or company, or to schedule a demo, visit sightplan.com today. About SightPlan: SightPlan provides software solutions to help apartment communities optimize operations while improving resident satisfaction. We believe that Great Teams = Great Communities, so we’re empowering leasing, resident service and maintenance team members with easy-to-use solutions to deliver exceptional service. To learn more about our innovative solutions, visit us at sightplan.com. About BH Management: Headquartered in Des Moines, BH Management focuses on real estate investment and property management. BH Management ranks as the 9th largest multifamily manager in the United States, with over 80,000 units under management today. The company’s roots date back to 1993 when Harry Bookey formed the company with a roster of just five apartment communities. Today, their founder continues to lead the firm, serving as inspiration for its 2,000+ employees. Their guiding principles are simple and direct: 1.) invest in employees—they are the front line of our team and the foundation of our success, and 2.) go above and beyond to satisfy customers. Their progressive approach to property management has enabled them to grow their third-party management business dramatically over the past few years. They have firmly established a national reputation as a quality service provider. For more information about BH Management, please visit https://www.bhmanagement.com/management-services/ or https://www.bhmanagement.com/communities for apartment listings in your area.